Custom Fleet Van Wrap for Zimmer - Philadelphia Vehicle Wraps - Apple Graphics Inc.
We completed 2 of the 4 Van Wraps for Zimmer Randall. These custom designed van wraps are going to be driving in different cities for their marketing campaign. As you can see on the graphic design, we took the actual metal material and blew it up for the front of the van and the product images along the sides. 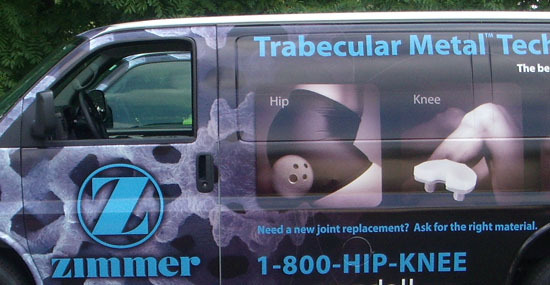 The next project for Zimmer will be another 2 custom wrapped vans with a completely different design. Fleet Wraps are great way to advertise your business on the road!